My favorite new program this year is Book Shorts. It's a short-story bookclub aimed at upper-elementary-school aged kids. One of the teachers who I have worked with quite a bit became principal of a local K-8 school this year. He approached me early in the year about helping him select books for a middle-school bookclub he was starting. I immediately jumped on the opportunity, and offered to do another bookclub with the younger kids. I had wanted to try a short story or 'homework free' type bookclub for some time, and this seemed like the perfect chance. 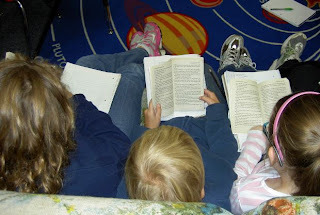 We had a short, twenty minute assembly for grades 3-5 to introduce the concept, which I decided to call "Book Shorts." I used clip art to make a picture of a book wearing shorts, and made flyers, posters, and a sign-up sheet (I should make the kids bookmarks...). At the assembly, I read book riddles from "Spot the Plot" by J. Patrick Lewis and displayed the 'correct answer' books. Then I pitched the bookclub, which was originally planned to coincide with lunch. I started by reading selections from various middle-grade novels. "Reid's Read-Alouds" by Rob Reid was a great resource for coming up with selections. I read parts of "No Talking" by Andrew Clements, "Alvin Ho" by Lenore Look, and "Ivy and Bean" by Annie Barrows. Before long, I realized that I was spending a lot of time agonizing over the selections and whether or not I would fill the whole time/run out of time/end at a good enticing point in the story. Anyway, like I said, I was agonizing. So I switched to reading longer/more mature picture books and we haven't looked back. We've read, "I'm a Shark" by Bob Shea, "I Want My Hat Back" by Jon Klassen, "Lighthouse Christmas" by Toni Buzzeo, and lots more. Today we read the second half of "The Minpins" by Roald Dahl, which we had started last week (They were enthralled, and scolded me if I forgot to show them the pictures). I love being able to share books that don't work for storytime, and I love sharing picture books with kids who might otherwise think they were too old for them. A few fifth graders came initially, but they quickly bowed to social pressure and stopped coming. We added some second graders and one first grader who the principal deemed mature enough. Then it became apparent that the kids weren't quite mature enough to eat anywhere but the cafeteria without leaving a big mess, so we shifted to one of the recess periods. Every week that I'm there the boys agonize over choosing recess (one of three) or Book Shorts, but often pick Book Shorts. I give the kids a piece of hard candy or sucker as they come in, and then I just read. We rarely have time to discuss beyond, "Did you like it?" but I'm ok with that. I think it's nice for them to do something during the school day that is just for pure enjoyment. Cover to Cover with John Robbins! Yes! Cover to Cover. I'm going to write a Cover to Cover post now.